In a large bowl mix the butter or margarine, confectioners' sugar, brown sugar, egg and vanilla together until light and well combined. In a medium bowl combine the flour, ground pecans and salt. Add the dry ingredients to the wet ingredients and mix until a soft dough is formed. Wrap dough in plastic and refrigerate for 1 hour. Roll chilled dough to 1/4 inch thickness and cut into desired shapes. Place cookies on an ungreased baking sheet and bake at 350 degrees F (175 degrees C) for 7 to 9 minutes or until light golden brown. I adapted these cookies to my taste by using hazlenuts instead of pecans and gave them as Christmas jar gifts last year...thanks for the inspiration! 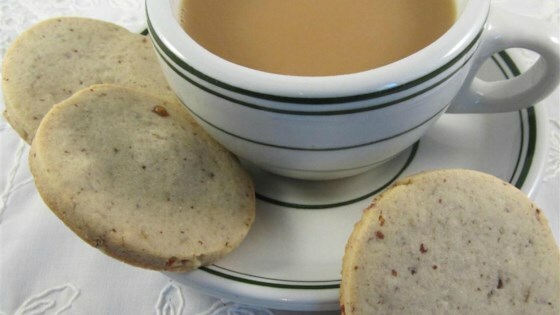 This is a nice little cookie that's not too sweet and perfect with a cup of coffee. The cookies are good, but even after an hour chilling in the refrigerator, they were way too soft to roll out or use cookie cutters.